From time to time (as I first mentioned in How Rats in the Bathroom Can Boost a Child’s Bilingual Ability), I ask my kids to memorize a poem in our minority language and recite it back to me. When they do, they earn a little treat. I can’t say they’re highly motivated to do this, but the treat usually provides them with enough incentive to complete the task and benefit from the effort. The other day, though, it wasn’t working. I think they felt burdened with other tasks and mine just made their load heavier. They moaned when I first mentioned it, and groaned when I gave them reminders through the afternoon. I could have let it go, of course—it wasn’t really a big deal to me that day, but it apparently was to them. Still, I was curious to see if I could get them engaged, even excited, about doing it if I added a bigger dash of the “magical ingredient” for motivating kids. I’ve worked with children and youth for a long time. I was practically a child myself (I still practically am) when, at 19, I served as a camp counselor for a cabin of 12-year-old boys at a summer camp in the United States. One day, at lunch in the large dining hall, I was sitting at the end of a long table with my campers, a tall garbage bin just behind my chair. Our lunch was winding down and all the paper plates and cups had to be passed toward me so I could throw them away. I’ve never seen such excitement over soiled paper products. Twelve years later I was in the Czech Republic with a group of Czech students. I was a 31-year-old English teacher and this was a two-day outing for college freshmen at a retreat center in the Bohemian countryside. In addition to a schedule of language classes, the teachers were asked to lead an additional activity of their choice. The other teachers put things like “Listening to Pop Music” or “Playing Word Games” on the sign-up sheet. It was intended as a joke, but two male students signed up so I carried on with it quite seriously. “Bring your toothbrush,” I told them. That afternoon we were in the men’s bathroom, scrubbing the urinals. And despite how absurd this was—and how normally we would have avoided such a task (especially with our toothbrushes)—we spent nearly an hour in there, enthusiastically cleaning. With straight faces—broken by fits of laughter—we even described and demonstrated our most effective techniques. After all, if “deliberate enthusiasm”—the conscious and tactical use of enthusiasm—can kindle motivation for throwing away garbage and scrubbing a urinal with your toothbrush, it can generate motivation for almost anything. And this is what I did when my kids were reluctant to memorize and recite that poem: I chose enthusiasm and I got enthusiastic. Instead of continuing to carp at them about it, I jumped in and began acting out the poem—like a game of charades—to help them remember it. The task suddenly took on a new tone—playful, fun—and my kids became charged with this same positive spirit. They now were able to complete the task quickly (and finally receive their treat). It might be argued that “deliberate enthusiasm” is “fake,” that “real enthusiasm” is spontaneously felt for activities we genuinely like. The interesting thing, though, is that enthusiasm can also be intentional and “deliberate enthusiasm” can serve as a springboard for “real enthusiasm.” In other words, even when enthusiasm is used as a conscious and tactical choice for rousing greater motivation, it can spark an experience of the “real” kind in everyone present. 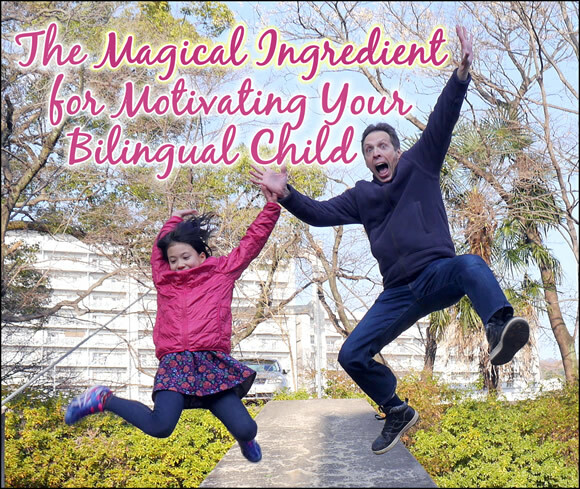 So the next time you’d like to get your kids more motivated for a task (even tasks involving trash or toilets), try a bigger, bolder expression of enthusiasm for that activity yourself and see if this “magical ingredient” could make them more enthusiastic, too. How about you? Any stories where your enthusiasm made the difference in motivating your children? I do that every time and well… It’s maybe fake at the beginning but when you see your children or any laugh, you enjoy everything you are doing. When I was 10 and my little cousins were 3 and 4, I always made up silly tales with poop or garbage or something like this to entertain them in the car or in boring places, and it was really fun! Yes, as I stress in Be Very Serious. Be Very Playful. The Bilingual Journey Demands Both., I think our level of success is directly related to our level of playfulness! When my kids were little they were required to ask questions in Spanish. And by required I mean I responded like I was under water, slow motion, when retrieving “milk”. When “leche” was requested I ran around the room whooping on the way to quickly get their milk. They had pressed the “crazy mommy” button by selecting the right language. They are bigger now and I’m grateful for your reminder and I’m going to reintroduce this. Piña, I love your “crazy mommy” tactic for getting your kids to use the minority language. Bravo! Feel free to share the contents of this post in any way you like. I hope it’s helpful to your work!